NMT Pest Control: Flea Control in Barnes SW13 - Welcome to NMT Pest Control. We control bed bugs, moths, wasps, mice, mouse proofing, cockroaches, ants, flies, spiders and other unwelcome visitors. 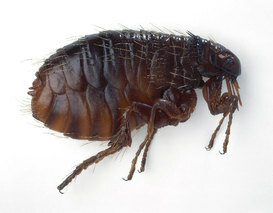 Flea Control Barnes:The distress caused when bites are discovered on ourselves or on our children can be considerable. Thankfully effective flea control treatments are at hand in Barnes SW13 to deal with the problem, quickly and effectively. Although Cats and Dogs are the preferred hosts for Fleas, they will, and do, feed on Humans when the opportunity arises. After every blood feed, the female flea will lay eggs, either on the host animal or near where the animal has been - such as bedding carpeting etc. Dog and Cat Flea Pupa have the ability to survive in a dormant state for long periods of time in empty properties where cats and dogs once lived. Often, when people move into a new property, they are targets for attack from the recently awaken pupa, and the cause of the infestation seems to be a mystery. The source of the infestation needs to be identified, most often a pet. Please note: Animal treatments should be carried out by a vet, and is not the job of a pest controller. Once the host animal (if there is one) has been treated, a spray treatment can be applied inside the property to kill all remaining Fleas and Pupa. The most important ingredient in the control of fleas, is using a professional insect growth regulator. This kills all the life stages of fleas in one go. NMT Pest Control offer a same day/next day service for flea control, and the flea treatment takes about one hour, from start to finish. To book a Flea removal treatment or for any more information please call Neil on 0203 2922179 today! if you would like to ask a question, please complete the form below and click submit!